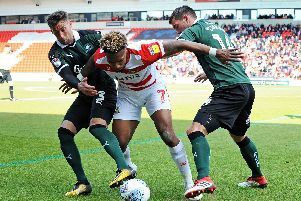 Grant McCann is confident of adding a midfielder to his Doncaster Rovers squad before the loan window shuts. EFL clubs can loan players and sign free agents until 5pm on August 31. McCann told the local media today he is optimistic about signing someone ‘a little bit different’ to his current midfield options. Rovers’ boss also revealed that one player will be allowed to leave the club on loan. “There’s a possibility of one going out and one coming in,” said McCann. “That’s where we are but we haven’t really made a final decision on that. “I’m sure it’ll come to fruition over the next day or two. “The Ali Crawford injury has left us a bit short in the midfield area, definitely. “Issam Ben Khemis has started to come to the party now. He’s looking good. He’s been a bit frustrated during pre-season in terms of match time and picking up a head injury in training and fighting his way back to fitness again. “Over the past week or so he’s looked sharp. He’s knocking down the door to be involved. “But I still believe we need something in there that’s going to be a little bit different to what we have. “That doesn’t mean a holding midfield player who doesn’t want to come out of his slot because that’s not the way we play. “It’s got to be someone who adds something a little bit different. “I’m confident it will happen,” he added. “We will look to bring someone in in that area. “Someone will go out to play games because that’s what they need.